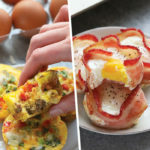 Whip up one of these breakfast egg cups so that you can have a healthy, high-protein snack or breakfast all week long! 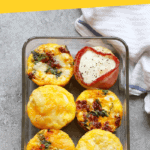 These yummy egg cups are ready in under 30 minutes and easy to meal prep. Why Make Breakfast Egg Cups? will last you all week! 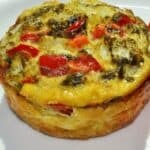 I thought we’d kick off the new year with not 1, not 2, not 3, BUT 4 breakfast egg cups recipes because you can never have too many! Making breakfast egg cups is super simple. First and foremost, you’re going to need a super non-stick muffin tin for all 4 of these recipes. We say super nonstick because we’ve all been there. When you can’t get your egg cups out of the tin. Here’s the one we use! Second, while we’re sharing 4 different healthy egg cup recipes in this post, making your own variation at home is super simple. Here’s the basis of what you need. large eggs: we prefer large eggs, but any size will work! veggies: any kind of veggies will work! Some of my personal favs include spinach, peppers, onions, and mushrooms. protein: think breakfast sausage, bacon, ground turkey, etc. cheese: the more cheese the merrier! Shredded cheese works great with egg cups. spices: you can’t go wrong with salt and pepper, but feel free to spice things up with any spices your heart desires! milk: a splash of milk in your egg cups goes a long way. We love using almond milk for this, but any kind of mill will do the trick. How do you make your egg cups not stick to the pan? Make sure you are using a high-quality nonstick pan just like this one. We also suggest using coconut oil cooking spray on the pan before adding your ingredients to the muffin tin. How long do cooked eggs last? Cooked eggs should last you anywhere from 3-5 days in the refrigerator. How many eggs is a cup? Around 4 large eggs equals one cup. So, if you’re looking for how many cups 1 egg equals, it’s about 1/4 cup per large egg! Is it okay to reheat eggs? Yes, you can reheat eggs. We suggest reheating your breakfast egg cups in the microwave on high for around 30-60 seconds. How should I store my breakfast egg cups? We recommend storing your egg cups in an airtight container in the fridge. They should last you up to 5 days. 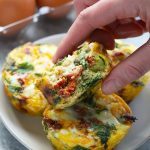 You are going to love these flavorful Spinach and Sun-Dried Tomato Egg Cups. They’re made with sun-dried tomatoes, spinach, onion, fresh basil, and a little feta cheese! Yum! These Turkey Fajita Egg Cups are made with lean ground turkey, colorful green and red peppers, onions, and your favorite fajita spices! Don’t forget about the cheese on top. These All American Hashbrown Egg Cups are perfect for picky eaters. They’re made with homemade hash browns, breakfast sausage, and cheese! Pro tip: try subbing out the hash browns for shredded sweet potato! These are exactly what they sound like. Bacon + Eggs = Bacon Wrapped Egg Cups! These delicious little guys are keto-friendly and packed with protein. 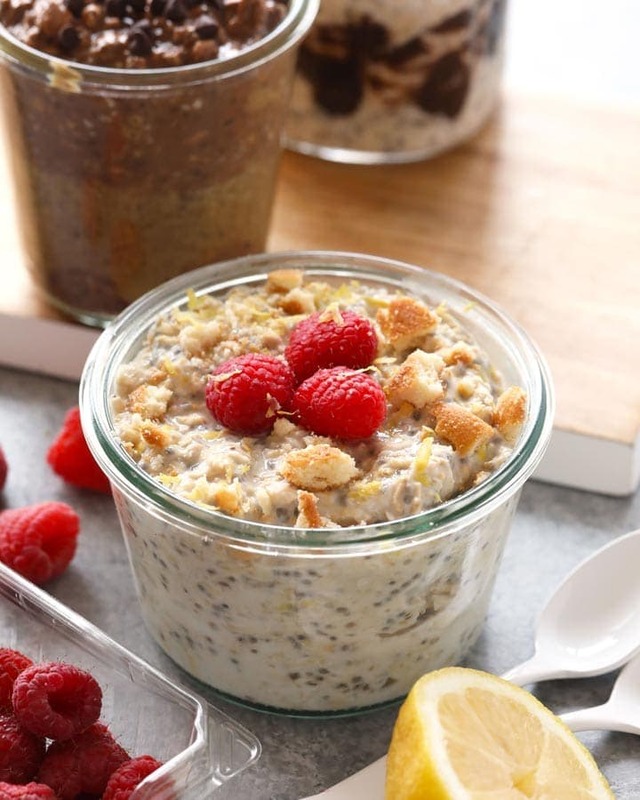 Whip up one of these healthy egg cup recipes so that you can have a healthy, high-protein snack or breakfast all week long! They’re ready in under 30 minutes and easily transportable. Preheat oven to 350ºF and spray a 12-cup, nonstick muffin tin with cooking spray. Next, finely dice sun-dried tomatoes, spinach, basil, and yellow onion. Then spread out among the 12 cups. Add about 1 teaspoon of feta cheese crumbles to each cup. Season the top of each egg cup with salt and pepper, to taste, and then bake at 350ºF for around 18-22 minutes. Add 1/2 tablespoon of olive oil to a nonstick skillet and heat over medium/high heat. Add ground turkey and spices and saute until turkey is fully cooked. Transfer browned meat into muffin cups. Then prep vegetables by finely dicing green pepper, red pepper, and onion. Evenly spread out among muffin cups. Bake at 350ºF for around 18-22 minutes. Preheat oven to 400ºF and spray a 12-cup, nonstick muffin tin with cooking spray. Set aside. 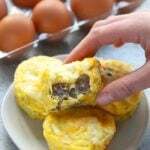 Next, use one piece of bacon per muffin to create a basket of sorts for the egg. Place the bacon on the inside of each muffin so that it covers the sides completely. Then, use a pair scissors to cut the remaining bacon. Use this excess piece of bacon for the bottom of your basket. Repeat with all pieces of bacon. Place bacon in the oven at 400ºF for around 7 minutes. Remove before they start to get crispy. Crack 1 egg inside of each bacon basket. Make sure that you use large eggs as anything bigger will be too much egg to hold in the muffins. 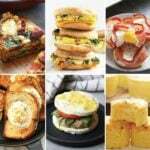 Bake for an additional 10-15 minutes depending on how runny you like your eggs. Finally, season with pepper and enjoy! **Read a full tutorial for this recipe HERE. Peel 2 medium red potatoes and then shred with a cheese grater. Place shredded potato on top of a thin rag, cheesecloth, or paper towel and squeeze out as much excess moisture as possible. Place into a snall bowl and season with garlic powder, salt, and pepper. Then, spread evenly among the 12 cups. 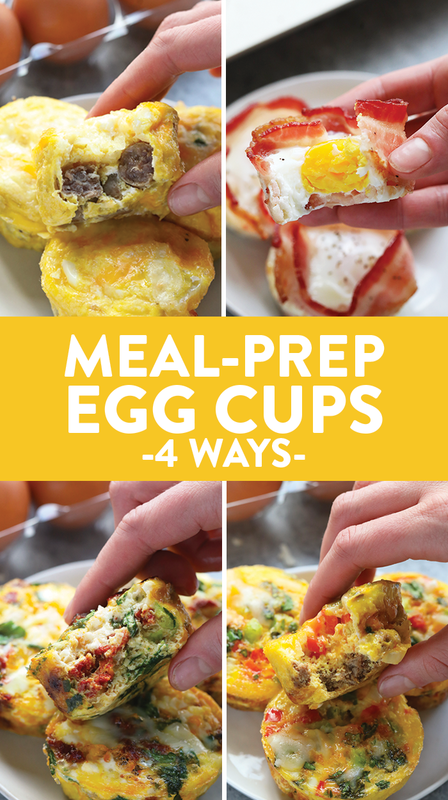 Each of the 4 egg cup recipes makes 12 total egg cups. Nutrition information is for the Turkey Fajita Egg Cups.